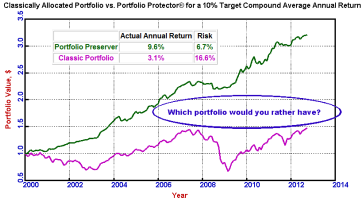 Portfolio Preserver ® Home Investor "Maximize Returns / Minimize Risk"
• Left you poorer rather than richer? • Made you afraid of making investment decisions? Then the Portfolio Preserver® is for you! The Portfolio Preserver® is a monthly report sent to your email address that will tell you exactly how to rebalance your portfolio. Your report will contain an easy to read table telling you specifically what you need to do (if anything) to keep your portfolio in top running order. For a test drive, please sign up at right for our free sample email report. For more details see the Email Report Guide. The Portfolio Preserver® allocates investments among a diversified set of asset classes: small & large cap stocks, government & corporate bonds, real estate, international stocks & bonds, and optionally, gold. These asset classes are allocated according to the Nobel Prize-winning strategy called Modern Portfolio Theory that is designed to produce the desired return at minimum risk. The strategy works very well in markets that are rallying but blows up when the market sharply corrects, and that's where the Portfolio Preserver® steps in to save your nest egg. Using our patent-pending timing enhancement to Modern Portfolio Theory, your portfolio's value will be preserved while simultaneously reducing your risk. The best thing about this approach is that it is purely mathematical with no human judgment interfering with the process. Sharp market downturns during the past 25 years have devastated investment accounts. Unlike the classic approach to asset allocation used by many money managers, the Portfolio Preserver® approach would have protected your nest-egg during these critical times. The graph (click to enlarge) shows the dramatic differences in both risk and return between these two models. Which approach would you rather have taken? It's easy to get started just click here or on the Subscribe Now! button at right. What you have to lose is nothing. If after two months you don't like our service, we'll refund your money. No questions asked. Instead of losing money during the next market downturn, make it! All you need to do to get started is to answer two simple questions and a portfolio will be customized to your level of investment comfort. It's that easy!